BACK IN STOCK!!! The new wave of the Texas Grindcore and Powerviolence movement. 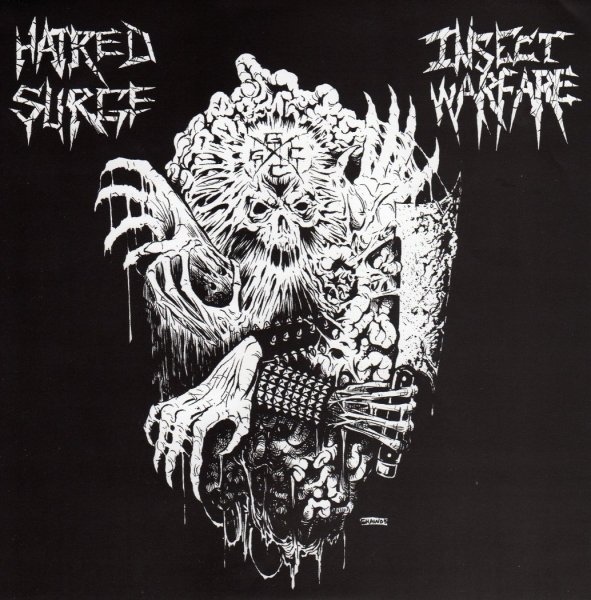 On side A is one man (literally, he plays every instrument on the recording) grindviolence unit HATRED SURGE. This is Alex from Machine Gun Romantics solo project and will appeal to fans of Despise You, Discordance Axis, and Disrupt. On the flip side are Gulf Coast Grindcore executioners INSECT WARFARE. This band features members of other Houston Grind/Fastcore bands Pretty Little Flower and Machine Gun Romantics and will appeal to fans of "Extreme conditions" era Brutal Truth, Exhumed, Repulsion, Arsedestroyer and World.